First off, this family session is one of our favorites because this family kept laughing throughout the session! Second, look at their choice in outfits! It’s so bright and complimenting of each family member AND it just screams FUN! Third, rain or shine, we are so happy to have clients who are willing to photograph in any setting/weather and give us complete trust in our capabilities to deliver the best of the best photos to represent them. The sunset on this gloomy day came out so lovely for this visiting family from Japan. 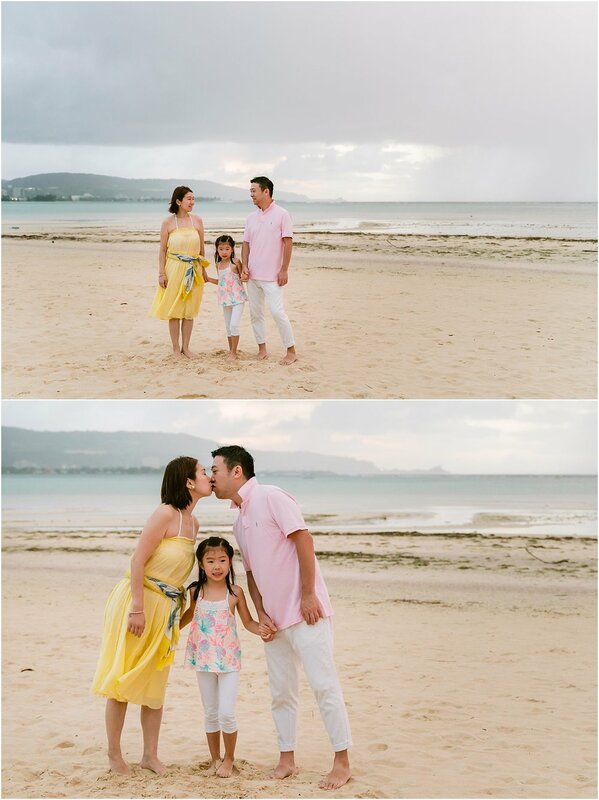 I remember being worried throughout the day that the gloomy might not produce a sunset yet the family didn’t care because they wanted their memories of their first time on Guam to be documented with their adorable daughter. Oh my gosh… Their daughter was so fun to interact with! She loves to laugh and run. Fun. Natural. Effortless — Welcome to Guam!